This is our Genkan, which means entrance hallway in Japanese. It is the place where you take off your shoes and dump your keys and mail. Currently we have no where to do this so I am looking for either a bookshelf or a narrow hallway table. 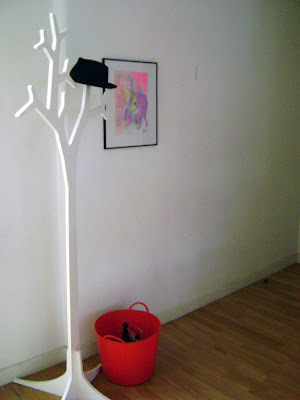 We do have the cool tree shaped hat and coat stand which is really handy, and our recycling bin which at least is red. I really want this from ebay for our entrance hallway, so we have somewhere other than the dining table to dump our keys and mail. I would want to paint it white but I'm not sure how feasible that is to do in an apartment...we have no garage to paint in. Hmmm maybe I will keep looking for something white. 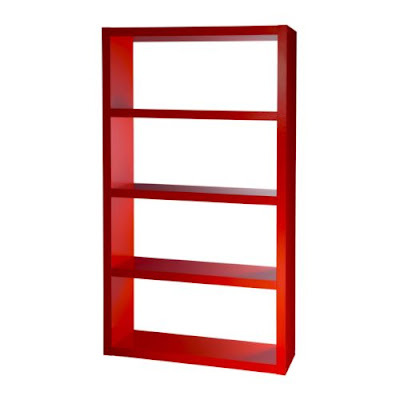 I don't want a bookshelf per se, I want a thin hallway table or something similar to this ebay bookshelf. Something that we can place a bowl for keys and then also some photos and art displayed on it. I have wanted something like this for a long time but the situation is getting serious, the dining table is always covered in letters, junk mail, keys and sunglasses, it would be nice to have a place where those things can stay without being in the way. I got the new 2009 Ikea catalogue and I fell in love with the Trollsta yellow sideboard which at $629 is way too expensive for me right now. I don't think it will suit the Genkan anyway, it is too low and long, I'm not too sure where I would put it in the house either, but I do really love it. Oh and Henry's mum bought us the flowers. They look so cute. 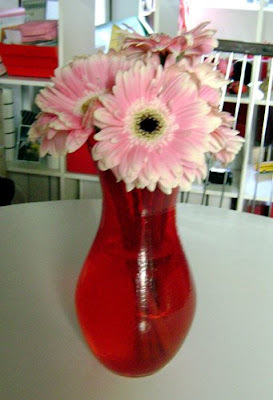 I think I'm going to buy flowers more often, they really make a room shine. It would be easy to paint that white inside. Put down some old newspaper, buy a sample pot (about $12) and paint away. Aww hachiko is so cute there! I have a soft spot for small dogs. What's it like having a dog in an apartment, how do you take him for walks or toilet time? scuse the questions - I've been looking on/off for some city dwellings but I have a small pup and I don't know how animal friendly apartments are. Chantelle: Thanks for the comment. I think I will try and win the shelf on ebay now, painting it doesn't seem to hard. Sarah: Having a dog in an apartment isn't too bad really. Hachiko has been trained to pee in the bathroom in a kitty litter tray lined with paper towel (he ate the kitty litter, lol so now we use the paper) to train him to do that we bought some puppy pee pads that you use to train dogs to go in certain spots...they have a special scent on them or something. Then when they do it in the right spot you reward them with a treat. It really worked. The only time he doesn't use it is if someone is in the shower and the door is shut, luckily our couches are vinyl. He also poo's in the bathroom right in front of the toilet, so we just pick it up and flush it. We take him for a walk once a day (well sometimes once every 2 or 3 days because of life getting in the way) but he is really happy living here. The only problem we have is he has started to bark at small noises coming from the outside hallway, like our neighbours coming home....but we are in the middle of training him to stop doing that...we just say "Nooooooooooooo" in a really deep voice and point at him...it seems to be working. Yea, my dog is a yapper too - one of the perils of small breeds. Thanks for the insight, I always wondered about doggie apartment life. Thanks anon...I did say we walk him every day, just occasionally we run out of time just like everyone else who has busy lives. It's not like he goes weeks and weeks without a walk, its at most 3 days and that is very rare. In Japan one of my Japanese co-workers was complaining about her 2 "crazy dogs" who just ran around and barked all the time in her apartment. I asked her "how often do you walk them?" and said "ehhhh, walk them? what do you mean?" it turns out that she had never ever walked them, so I told her "well you are meant to walk your dog every day" and she thought I was crazy, that no way anyone could be bothered doing that. So at least I'm not that bad. Hachiko gets walked 99% of the time every day. He is the type of dog who doesn't walk when its raining, so on rainy days there is no point taking him out (I bought him a raincoat but it didn't help, he hates having it on) so yeah if anything Hachiko is spoiled too much. But yeah thanks for your concern. 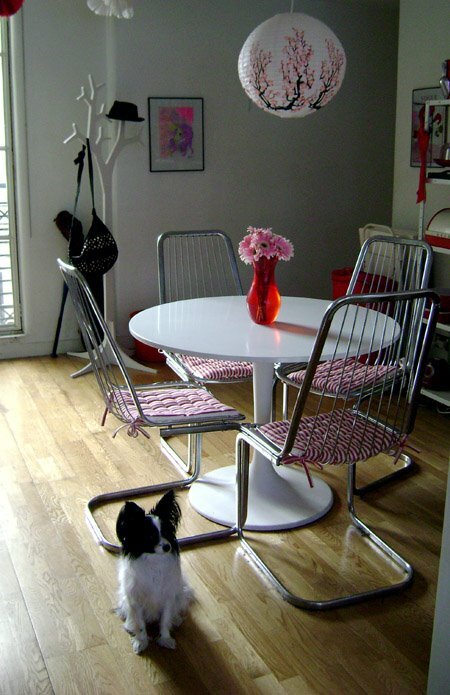 Hi there, I love your apartment (and your blog! ), it's very sweet. There is a store called Dwell in Kensington which might have some hallway tables/bookshelves you may like. I'm in the process of redecorating and I can feel your pain of trying to find something I like yet practical at the same time. I have the same pigeon hole bookcase/shelf as you and what I've bought is those wicker baskets from Ikea that slot right in - to store magazines. Yo flat was so amazingly stylish and put-together! I love the white hat stand. Wow the white pink and red are so pretty together! Minimalist, but not too. Especially love the flowers in conjunction with the cherry blossom lamp. PS-- is Hachiko a papillon? great ears! What a lovely lamp above the kitchen table! I agree on the lantern/light - how cute. p.s. I do like that IKEA sideboard as well.